Classes are between 2 ½ and 3 hours, depending on the menu, during which time we will prepare 3 to 4 dishes start to finish. All menus are custom designed to suit your tastes, skills, and kitchen equipment. Classes can be held in any kitchen in the greater Seattle area. No kitchen is too small to teach in, but also be prepared to use tabletops in living or dining areas as extra class space. If you’d like to inquire about private group classes (min 6 people), I occasionally open up my home in Seattle for larger parties. Classes are tailored to individual tastes and instructional needs. Each student will receive electronic copies of the recipes at the end of class. Please tell me your prefer hours and dates. Class costs include all fresh ingredients, which I procure, but not basic pantry items. If your menu choices require specialty ingredients beyond the scope of the sample recipes, supplemental fees may apply. Class options are available for larger parties. To inquire about availability for a big group, please contact me. Call (425) 998-8241 or email olive@cookingdolls.com to arrange your next cooking adventure with Olive. 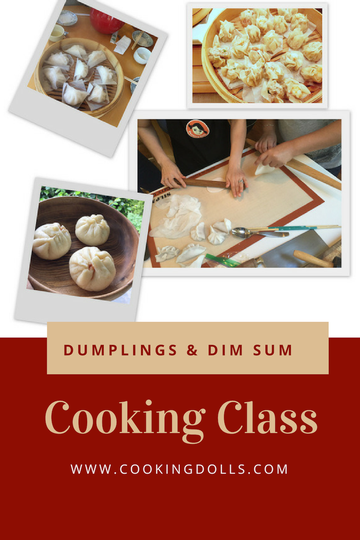 Be part of this hands-on Dim Sum making fun at the comfort of your own home or my kitchen! Enjoy this deliciousness and get inspired to cook Chinese food for your next occasions! I will come to you and lead you step by step on how to prepare your own Dim Sum dishes. Note: There is minimum four students per class. See Sample Cooking Classes here. Choose two main dishes and one dessert or three main dishes from the list: You can request your ideas as long as it can be fit into 2.5 hours class, we can do it! XLB, Shao Long Bao (Soup Dumpling) Note: When this item is requested the class will only accommodate 3 items total due to more works goes into this dish. Call (425) 998-8241 or email olive@cookingdolls.com to arrange your next cooking adventure with Olive to request a date you have in mind. Please check back for our latest new classes offered! Note: Glutinous rice/sweet rice flour does not contain dietary gluten (i.e. does not contain glutenin and gliadin), and should be safe for gluten-free diets.